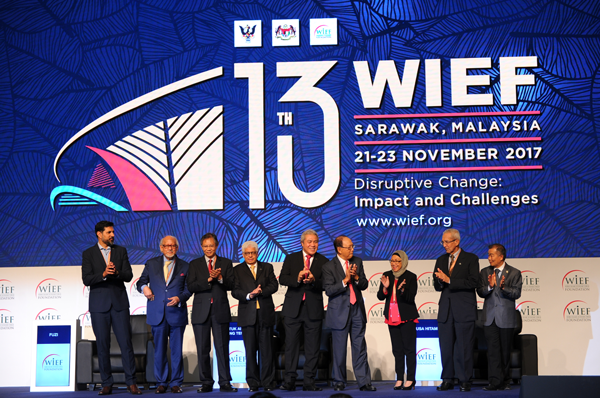 Sarawak, Malaysia, 23 November: The 13th World Islamic Economic Forum (WIEF) closed today on a high, delivering long-lasting impact across businesses, countries and communities, and paving the way for a successful next edition. Centred on the theme ‘Disruptive Change: Impact and Challenges’, the three-day Forum focused on high-level dialogues on global forces of disruption, panel discussions on business challenges and workshop-style sessions to develop actionable plans. The Forum opened on a big win for the business community with 16 MoUs being sealed, amounting to US$2.43 billion – the highest-ever commercial value ever achieved in a single edition in the history of the Forum. The MoUs exchanged covered the technology, halal food and energy sectors, nine of which were with international organisations. Beyond their commercial value, these MoUs deliver a high impact to the global business community by creating new collaborations, opening new markets and uncovering new ways to capitalise on opportunities presented by a variety of disruptive forces shaping the world today. Launching the inaugural WIEF alumni network on the second day underscored WIEF’s commitment to enable the global community. The WIEF alumni network brings together 17,000 members – all connected on a single digital platform to help members network and collaborate seamlessly across borders to take the Forum discussions into action. This marks the first time the World Islamic Economic Foundation is aggregating the untapped power of its global network to advance its agenda of driving co-operation between Muslim and non-Muslim nations set against a backdrop of disruptive change. In addition, the 13th WIEF outperformed its previous discussions by attracting leaders, captains of industry and delegates from over 77 countries – the most diverse representation of the global community in the history of the Forum. The launch of the inaugural alumni network thus capitalises on the growing global relevance of the platform. Enabling communities was a third pillar of the Forum’s agenda. To this end, the Forum organised a combination targeted activities for a variety of communities. MOCAfest is the Forum’s dedicated platform for showcasing the arts and culture of the local communities and during the 13th edition, MOCAfest stepped things up with an even wider programme of musical and artistic performances, as well as exclusive fashion capsules from local designers. As a strong proponent of the community of women business leaders beyond the Forum, the 13th edition stepped things up with a deep-dive into the topic of developing entrepreneurship in women, discussing what the right support structure would be and how to accelerate access to funding. Last but not least, the Forum included a hands-on live pitch session for startups to raise funds directly with the venture capitalist and investment community. “The 13th WIEF was a tremendous success and is in many ways our strongest-ever edition. We intentionally focused on creating concrete opportunities and action points to truly enable businesses, countries and communities – a mission that the World Islamic Economic Forum is in a unique position to deliver. More importantly, all the MoUs, initiatives and programmes we have put in place over the last three days were aimed at creating a runway for positive action after the Forum – and leading up to next year’s meet,” said Tun Musa Hitam, Chairman of the World Islamic Economic Forum Foundation.